Harmony is a friendly, Electron-based application that enables you to play songs stored on your hard drive but also music from Spotify, Soundcloud, and Google Play Music. When running the program for the first time you will be prompted to log in using Google, Soundcloud or Spotify credentials. On the same window, you can select the location of your local music collection. Besides playing local or cloud music, Harmony also includes a Feed feature for exploring new music, plus you can create a list of favorites. 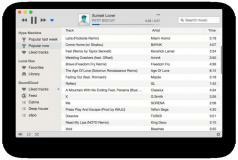 There’s also a shuffle option and a feature called Coverflow that provides a modern view for your music collection. Other useful feature include a resizable main window, support for keyboard media keys and system notifications. Recreate the sounds of various classic pipe organs on your computer.